Hugoton	Royalty Trust was created on December 1, 1998 when XTO Energy Inc. conveyed	80% net profits interests in certain predominantly gas-producing properties	located in Kansas, Oklahoma and Wyoming to the trust. The net profits	interests are the only assets of the trust, other than cash held for trust	expenses and for distribution to unitholders. The	trust was created to collect and distribute to unitholders monthly net	profits income related to the 80% net profits interests. Such net profits	income is calculated as 80% of the net proceeds received from certain	working interests in predominantly gas-producing properties in Kansas,	Oklahoma and Wyoming. Net	proceeds from properties in each state are calculated by deducting production	costs, development costs and overhead from revenues. Net profits income	received by the trust on the last business day of each month is calculated	and paid by XTO Energy based on net proceeds received from the underlying	properties in the prior month. Distributions, as calculated by the trustee,	are paid to month-end unitholders of record within ten business days. 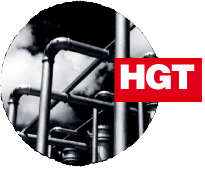 Units	of beneficial interest in the trust were sold in its initial public offering	in April and May 1999, and are listed and traded on the New York Stock	Exchange under the symbol HGT. As of May 12, 2006, XTO Energy is not a unitholder of the trust. OTCQX® Best Market, the most prestigious tier of the OTC markets operated by OTC Markets Group Inc, under the symbol, "HGTXU". Please see press release here.